Adding Related Posts Widget with Thumbnails helps for increasing your blog Pageviews easily. Its one of the smarter way to increase your Blog Popularity. This widget is really awesome as we have embedded it on this Blog TechEthix. It also decreases Blog bounce rate which is most important for blogger SEO. Thus there are also easy to install Related Posts Widgets Like LinkWithin, ShareHolic Share Widget, nRelate Related Posts widget. But This one is Fully Customized and there is no question about its performance, you can check the Features of this widget. So lets have a look on this widget. You can see below live image demo of this widget, preferably you should try out this widget, it has default background and CSS skin according to your blogger template. What's New In This Widget? 1.This widget is highly customized with CSS scripts as now a days every blogger wants to look his blog professional and more responsive. 2. You can set number of posts to be visible in this widget. 3. You can set Font Style, Size, Color. 4. It doesn't load on Blogger Home Page like LinkWithin. 5. Internal linking is perfect. 2. Fast Loading And SEO Friendly. 3. Shows Post of same category/label/tag. 4. Blog Post Title with Thumbnail. 6. Decreases Blog Bounce Rate. Wanna Try ? Let's See, How To Install This Widget ? 4. After the above code, Paste the Following Code just above it. 5. Now You if you want to change/modify above code then you can change it, I've Highlighted them with Orange color. You can Edit The Following Lines. font-size: 18px; - change font size. font-family: Arial Narrow; - change font style. 7. After finding the above code, paste the following code just below it. 8. Hit Save ! You are done. 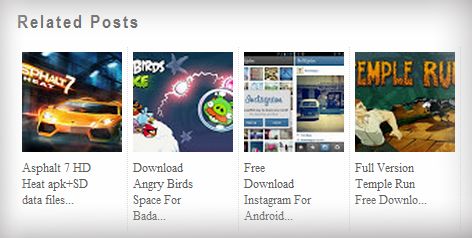 Got to your Blog and Check Our CSS Related Posts Widget with Thumbnails. Note : Change the 6 value from max-results=6 to set number of posts to be displayed in your widget, and please don't remove our attribution link from this widget as it has taken 4 hours for making this widget. Thanks. Do you love Us? Then Add Our Badge to Your Blog [Help us to spread our voice]. If you have any problem, feel free to contact me or you can also comment here. I just looking for a pure css widget.